This part deals with several physical features that are typical for elongated skulls, and that distinguishes them from normal human, Homo sapiens, skulls. I have included pictures to illustrate these features, and you can see many more pictures if you follow the links to the different continents on the Elongated Skulls from Ancient Races on Earth page. Text between square brackets  and bold emphasis are mine. Not all elongated skulls are the same. There is a lot of variation in their shape and form. As most of the current attention is to the extreme long Paracas skulls in Peru, other skulls of smaller size are often forgotten. Nevertheless, the latter also show features that are different from normal human (round skulls) skulls. For the latter a significant contribution was made by the 19-20th century John Thurnam, a British archaeologist who studied the English long skulls. Although the Paracas skulls are important, and the initial studies are already quite revealing, I hope the same attention will also go out to the other long skulls found all over the world. The most known long skulls are the extreme elongated skulls of Paracas, Peru. With those people it is obvious that these belong to a separate race of humans. 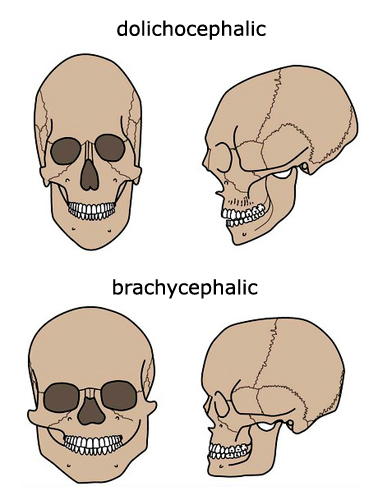 For the other races of people with long skulls which were medium large, sometimes in the horizontal plane, sometimes the forehead was slanted upwards at an angle, the archaeologists of the 19th and early 20th century based themselves on the cephalic index to measure skulls, and to distinguish these long head races from normal humans. So it is important to understand what the cephalic index is, and the terms they used. 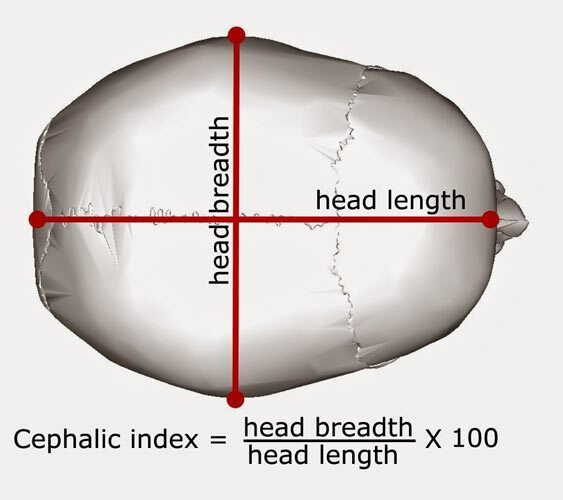 The cephalic index, or cranial index, is the ratio of the maximum width of the head multiplied by 100 divided by its maximum length, in the horizontal plane, or front to back. Round skulls, or brachycephalic skulls, are typical for what we know as present day humans, or Homo Sapiens. Their cephalic index is larger than 81-83, what means that the width of the face is slightly smaller than the length of the skull. In other words, they have a very round skull. When a skull has a cephalic index smaller than 71-73, its length, front to back, is a lot larger than with the round skulls. These skulls are called dolichocephalic skulls, or long head skulls, or elongated skulls. These skulls can be quite different and they were considered to belong to another human race. Mesocephalic skulls are those that are in between the round and long skulls, often ovoid in shape. They are the result of interbreeding of round skull and long skull people. When reading the following texts, keep in mind these terms. I will also use the term ’round skull people’ when referring to Homo Sapiens, or what we now call modern man. While we find extreme long skulls in in the Paracas region of South America, elsewhere in the world the elongation of the skull is not that extreme, but still can be quite larger and different in form than a normal round skull of Homo sapiens. The last comment, the depressed or platycephalic feature, refers to a marked flatness on the top of the head. It seems that this was common to the long head people of England. This is evidenced in the picture of one of those skulls, from a woman found in the Tilshead Long Barrow, and photographed by British dowser Maria Wheatley (below left). 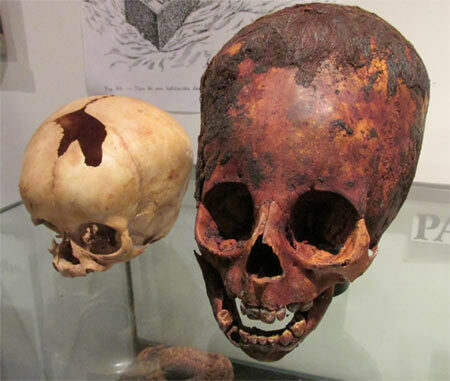 We find the same depression on the elongated skull from Malta (below right). In Europe not all elongated skull were of this type. With some of the skulls the forehead extended upwards at an angle and then went backwards. Below are two examples. Also notice that the shape of the skull is different too. The left one has a bump at the upper end of the forehead, while the middle skull is nicely rounded all over. The right skull from Austria goes straight backwards but is pointed at the back of the head. It is obvious that there were several different types, or shapes, of elongated skulls present in Europe. the elongated skulls in Middle and South America, where many of them have been preserved and displayed in museums. Forehead straight upwards with wide rounded top. It is obvious that there were many types and forms of elongated skulls in the world. The question is how did they all come into being. It is to be expected that there would a variance because of cross breeding between different races, but some of the extreme long skull still makes us wonder how they came about. The other question is about the brain mass which was larger than those of round skulls, or Homo sapiens. The volume of these elongated skulls is larger than that of a human skull, especially in the extreme long skulls of South America. Deforming a skull does not increase its volume. The cranial capacity of a human is between 1200 cc and 1850 cc with a maximum of 2000 cc (cc=cubic cm). The estimated cranial capacity of the elongated skulls of the Paracas region in Peru ranges between 2600 cc to 3200 cc. One wonders if the increased brain mass of these long head people also gave them additional or extended mental capabilities. In Europe however, the long skulls, are not that much longer or voluminous than a normal human skull, but they are still significant and have more volume. Some people have stated that some of the elongated skulls did not a sagittal suture because the excavated skulls did not show one. This would imply that they were born with two instead of three skull plates. However there is an underlying process that should be taken into account. This is totally unique to the long skull races. John Thurnam, the English archaeologist, who excavated and examined the barrows in the Salisbury plain, South England, was also a craniologist. With the elongated skulls (from the long barrows) he never mentioned a complete absence of the sagittal suture. In Thurnam’s drawings of the elongated skulls, a sagittal suture is always present. However he noticed a very particular feature. 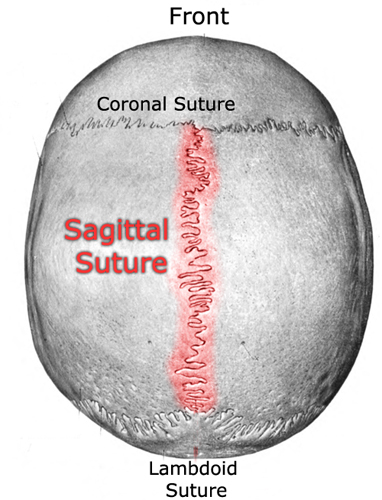 So, it is not that the long heads were missing the sagittal suture. The long head race had a tendency to fuse together the cranial plates at a much faster rate than was and is the case with the round heads. Sometimes it already happened when the long head person was in its infancy. Thurnam surmises that the reason for early obliteration of the sagittal suture is an exuberant ossification [bone formation] produced by a diet high in meat, and also because the closer contact of the skull plates at the sagittal suture [with long skulls] by which ossification happens much earlier in life. So, the long heads are not missing the sagittal suture. It ossified very early in life, so it became hardly perceptible later on in life. It is definitely a very defining characteristic of the long heads, as we do not see this happen with round skulls. 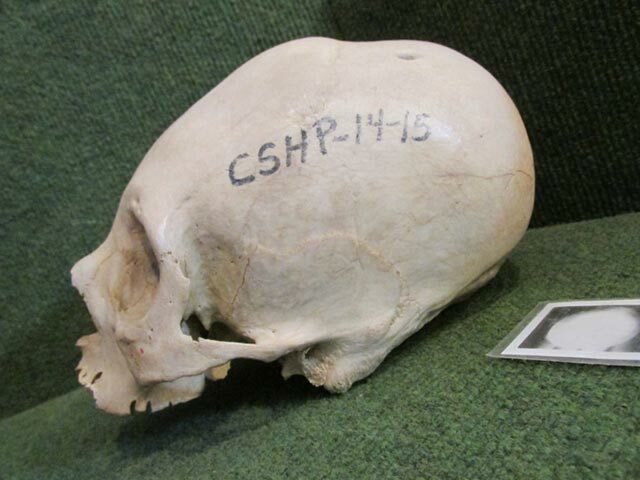 A Paracas skull from Peru with missing sagittal suture. “In the norma verticalis each skull had an elongated ovoid outline, though one was proportionately wider than the other, and the cephalic indices were respectively 75 and 72.8, dolichocephalic; the sagittal line was ridged, and the side walls were bulging,…” (Source: A contribution to the craniology of the people of Scotland. Pt. I. Anatomical. by Turner, Wm. (William), Sir, 1832-1916; Royal College of Surgeons of England, page 587) This source cites several dolichocephalic and hyperdolichocephalic skulls in Scotland. This sagittal ridge was also found in a contemporary find in Onavas, Mexico. See my page of South and Middle America (with picture). When examining the Paracas skulls from South America, both Brian Foerster and L.A. Marzulli discovered that the foramen magnum is in a different place than with a normal human skull. The foramen magnum is a large oval opening in the occipital bone (back and lower part of the skull) of the skull in humans and various other animals. The spinal cord passes through the foramen magnum as it exits the skull. Because the position of the foramen magnum is linked to the balance of the head in bipedal beings, it is to be expected that when a being has a very elongated skull, that the foramen magnum has to be in another place in order to balance the extra weight and angle of the long skull. Marzulli also states that the foramen magnum with the elongated skulls is smaller than with humans. At the same time it shows that these long skull people are not of the Homo sapiens race (that is, us, modern humans), or they are of a very modified human race. For so far as the hair of mummies has been studied, both the Paracas aristocracy and the Egyptian dynastic rulers had several members among them that had red hair. Both lived among people with dark hair. The Paracas skulls are well preserved because of the dry climate and soil. Some of them still have their hair, which in every case is (naturally) red. That is interesting because recent DNA analysis of the Neanderthal genome have shown that Neanderthals had red hair. Did the Paracas people inherit their red hair color from cross breeding with Neanderthals in the distant past? We also find red hair with the long head rulers of Egypt. Queen Tiye, the mother of the famous Akhenaton had red hair. A lock of her hair was found in Tutankhamen’s tomb and upon testing it turned to be auburn. Ramses II’s skull was dolichocephalic, or long headed, with an cephalic index of 74 as measured by Archibald Sayce (1845-1933) who was a British Assyriologist and linguist, but also worked in Egypt. And, Ramses II’s hair was red. Queen Tiye with red hair; she also had a long skull. Ramses II: cephalic index of his skull is 74. and red hair. Some researchers have noticed that some elongated skulls have two holes on the back of the skulls, which are not present on normal human skulls. That is not correct. They appear in normal human skulls too. They are called ‘parietal foramen’. They can be present in he developing fetus, but ossify quickly. Due to a genetic defect in some people, they do not ossify or close, and are thus open and present in adults. Brian Foerster of Hidden Inca Tours pointed out this feature, but does not seem to be familiar with the parietal foramen feature. Until this has been researched more in depth, we cannot see this as a different characteristic in regards to normal skulls. a normal human skull showing the two holes. From the larger size of the Paracas skulls, it has been deduced that these humans must have been seven to eight and a half foot tall. As most skulls have been separated from their skeletons (especially by illegal digs) their is not much information of how tall these beings really were. In Europe the long head people were rather small in stature: about 5 feet 5 inches (John Thurnam in On the two principal forms of Ancient British and Gaulish Skulls (1865), page 40-41). They did not have the extreme long skulls of the Paracas people. The length of the skull was less. Below is a child’s skull found at Lake Titicaca in Bolivia. The child was less than two years old because the fontanel had not yet closed, indicating an age of less than 2 years if this was a human child. Nevertheless this baby skull had 24 teeth. With humans, on a six year old child can have 24 teeth. With humans, the nasal root is the top of the nose, forming an indentation at the suture where the nasal bones meet the frontal bone (the skull plate that forms the forehead). While some of the long skull people existed thousands of years ago, some of them were still around not so long ago. 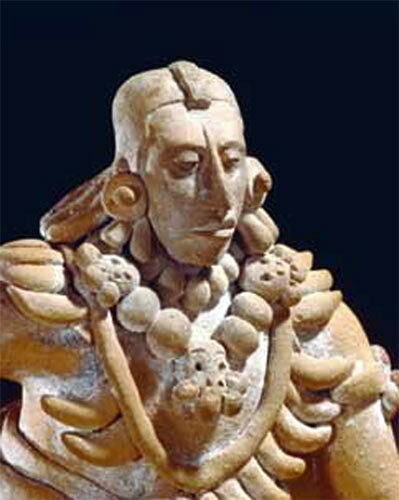 The Maya cultures in Meso-America left behind a lot of statues and clay figures, which show that many of their aristocratic members had not only elongated skulls but also long noses that start way up on their forehead. In my opinion it was a natural feature of those people. If they used these stone inserts, then they would have been found with the skeleton remains, wouldn’t they? Furthermore, The skin is very tight above the nose. They would have to cut open the skin in a straight line, place a stone piece in it and try to pull the skin over it, and sew it back together. I think it is not possible, besides being painful, even if you want to insert the stone piece through a small cut, and shuffle it upwards. Also, the area of the bridge of the nose is irregular, so try to cut a piece that will fall smoothly in place with the rise and fall of the nose, bridge of the nose and forehead, and make the line of the ‘artificial nose’ straight. Besides all that, you will have a good scar remaining too. The important thing is that the supposed stone inserts have never been found. It looks like these long noses beginning in the middle of the forehead were a natural feature. How that came about is again speculation, but probably it was another genetic mutation, or the result of genetic manipulation. If you are interested in the details of his ongoing DNA analysis of the Peruvian elongated skulls, visit Brian Foerster’s very interesting Hidden Inca Tours website. The Paracas child (right) compared with normal human child of the same age. Needless to say how very different the skull itself is! So far, in regards to the Paracas people in Peru, we are looking at human species, separate from Homo sapiens, which ancestry came from Europe. That is interesting because the Paracas people had red hair, and the other species that had red hair were the Neanderthals which lived primarily in Europe and the Middle East. National Museum, Copenhagen. Left and middle skulls are elongated and trepanned. 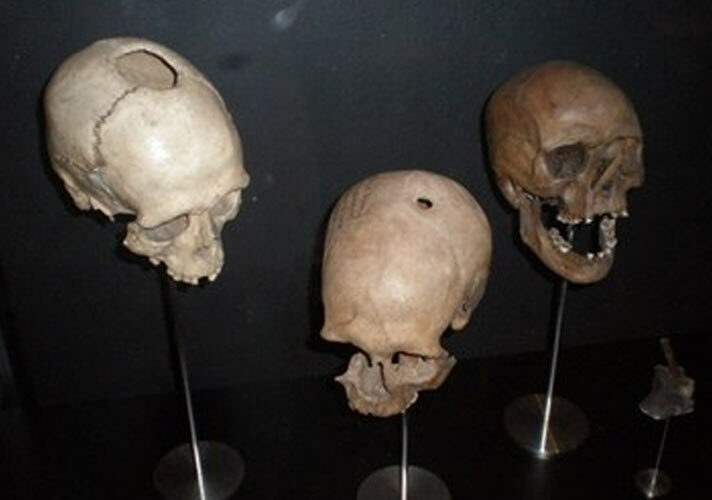 It is also noteworthy that all over the world trepanation was a common practice among people with both round and elongated skulls. Why would this be? Maybe because their unusual head shapes were causing problems for their brains. Trepanation is usually done to release pressure underneath the skull. Some skulls have multiple trepanned holes, some of them even very large holes. Trepanation is not something you do for fun, there has to be a serious reason for such an operation. Some people have suggested that trepanation was done to enhance certain psychic abilities. When you look at the holes, it is clear that these were made by cutting with stone, or maybe metal, knives. A rather crude process. So, I think that it was done rather as a last resort to some serious medical issue. We saw that Marzulli is of the opinion that the Paracas people not only came from the Middle east, as evidenced by DNA analysis, but that they were created there by genetic engineering by extraterrestrials. That might be hard to swallow by some most people, but a genetic intervention explains a lot. if there was only a random genetic mutation in an individual producing a long head, then his descendants would most likely have the same long head. What we see however is that there are many different types and shapes of long heads. That points more to an ongoing genetic tinkering by someone, trying this and that until they got what they wanted, if they ever did. I also wonder why they were doing this; what were they trying to achieve with a new human race gifted with long heads, and thus more brain mass? The Middle East always have been in the spotlight of those who believe in the extraterrestrial intervention in that place. It is the region where there was a sudden uprising of advanced culture, and legends of gods who came down to bring humanity all kinds of gifts, like agriculture and writing. Mesopotamia is considered the cradle of civilization for the Western world. Mesopotamia the area of the Tigris–Euphrates river system. In modern days it roughly corresponds to most of Iraq plus Kuwait, and the eastern parts of Syria. Mesopotamia has a very long history, but the height of the Sumerian civilization is around 5000 to 3000 B.C. It is during the Sumerian civilization that the so-called extraterrestrial intervention is supposed to have taken place. This period also corresponds to the long head skull people in England and continental Europe. It well established by DNA research that the European people migrated from the Middle East. So it is possible that something happened around or before that period in the Middle East that resulted in the emergence of long skulls? If the extreme long skulls emerged in Mesopotamia, a couple of thousand years ago, we would expect to have found some of their remains in that region. So far no extreme long skull have been found, although a few long skulls have been excavated in nearby countries. 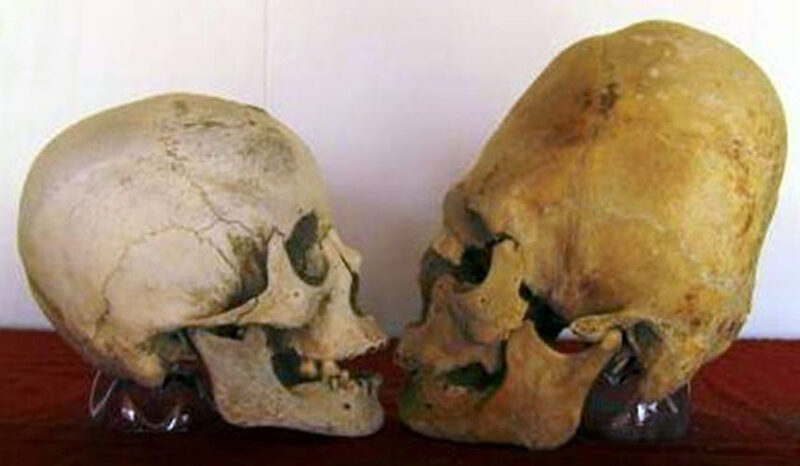 (click on pictures to go the Elongated Skulls Asia page) They are pretty long but not nearly what we find in Paracas, although some of the Paracas people also had the less longer skull type. Life-sized head, carved in basalt, was found in the region of Lake Jabbul, east of Aleppo, Syria in 1926. That is not much to go on if one wants to point the Middle East as the origin for the extreme long skulls of the Paracas people, despite the fact that they have a Middle eastern haploid group in their DNA. It is also possible that the long skull Middle Eastern people migrated to the Americas, and that the extreme long feature happened over there. We do have a family of very long skulls appearing in Egypt: Akhenaton and his wife Nefertiti, and their daughters, and Tutankhamen who was or a son or grandson of Akhenaton and a human woman. They lived in the century of 1300 B.C. In regards to the other types of less long skulls in Europe, Asia and North America, these people seem to have been widespread, and migrated throughout the continents. So far it seems that the long head Neolithic people migrated east and west from the Middle East. But where the long head Middle Eastern people came from is still an open question. The Paracas people are thought to have flourish between 800BC and 100 BC, at least according to official estimates. If their European origin holds true with further DNA tests then the first settlers of this race might go back even further in time. Long skull people in South America have survived much longer than the former estimate. Brian Foerster radiocarbon dated a skull that proved to be only 800 years old. In Europe some elongated skulls were still around several centuries ago in the Basque region of Spain. See Elongated Skulls from Europe.